"We have inherited a government in ashes"
I wonder what he is feeling now, now that he has turned Greece into ashes. During his three year term this man has been actively trying to change article 24 of the Greek constitution which states that the government has a responsibility to protect the environment and bans the re-zoning of the environment except under certain conditions (click here for article in Greek) He and his government wants to make it easier for construction companies to build in environmentaly protected areas. Just last month in the middle of those fires the government legalised illegal houses built on burnt land. A property developers dream. The BBC interviewed the president of the Hellenic Property Federation, Stratos Paradias who is trying to counter public wisdom that property developers are behind the fires "That's absolutely nonsense, this allegation, because if there is a company which wants to get its hands on some piece of land, to burn this land is the worst way to do it. Once a forest is burnt, according to our constitution, within three months the Forestry Service is obliged to pass a decree according to which this land is reforested." Yeah right. This government, as proven by the fires, have been absent in the enforcement of these laws, which is not only lax, but non-existent in Greece! 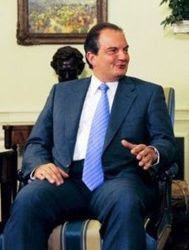 The trouble with Karamanlis and Paradias is that they think that they are so smart, everyone else is stupid and no one will know. They are the stupid ones, a WHOLE WORLD is watching this and is expecting Greece to clean up its act. Nikos Charalambides, director of Greenpeace in Greece placed the blame at the feet of those responsible "the biggest arsonist is the state, which has not clarified the use of land, leaving suburban forests vulnerable to rogue developers. The lack of a national land registry and national zoning laws leave room for doubt about the characterization of land, whether it is forest or not" more elequently than i could ever have, basically because i am angry at these people. These reports are also repeated on SKY News UK and CNN. For some reason this isn't getting airplay on Greek Media. Do they want to build on this land too? Are their interests at stake? I dont care anymore, the truth however needs to be said. Nice post m8, although I don't believe that the government or any other political party did this just for votes or for constitution changes... I just believe that the reaction to the fires (from the government) was the worst possible one!! !